Individual camouflage is the concealment a soldier uses in combat to surprise, deceive, and outwit the enemy. The ground is the soldier’s observation post, jump-off point for, attack, route of advance and communication, fortification, protection, and obstacle. He must know how to use the ground for effective concealment. He adapts his dress for best concealment while in the firing positions and for mobility, and carefully selects his routes between positions for such concealment as is possible while he is in motion. Interruptions, crawling (very slow) and running (very fast), aid concealment of motion. The simple principles in this book have been battle tested. If the soldier learns and practices them continuously in training, he will know what to do about concealment at the right time in battle. 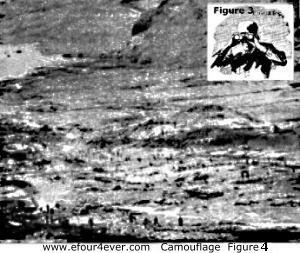 Camouflage activities of the individual are designed to deceive two kinds of enemy observers: ground and air. The above photograph shows a ground observer’s view of a landing operation. We are all familiar with views from the ground, but views from the air are different. Many things that are invisible from the ground can be seen from the air. 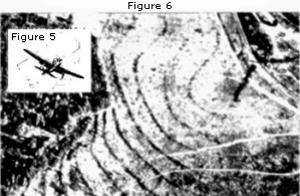 In modern war, the enemy puts much reliance on aerial photographs for information about our activities and our intentions. The more they reveal to him, the better prepared he will be, and the harder to defeat. By becoming familiar with the different look of things from the ground and from the air, by study of the ground view, and by studying aerial photographs, you can learn how to guard yourself and your unit against both kinds of observation. Bear in mind, too, that hostile observers both on the ground and in the air may use field glasses, telescopes, and cameras equipped with special lenses to increase their range of vision. Effective concealment of the individual depends primarily on background—your choice of it, and your knowledge of how to employ it to your advantage. Background is your surroundings seen from the ground and from the air. They may be anywhere—a portion of a jungle; an area in a barren, rocky desert; a farmyard; or a city street. Background is the controlling element in individual concealment. It governs every camouflage measure taken by the individual. You wear clothes which blend with the predominant color of the background, and tone down the color of your skin and your equipment for the same purpose. You practice blending with your background by hiding in shadow and by avoiding contrast between your silhouette and the background. You avoid movement which the stillness of the background will emphasize. To keep the appearance of the background free of signs which point to the presence of military personnel, you follow concealed routes; and you conceal spoil, tracks, equipment, and installations. This book tells how you —the individual soldier— can conceal yourself. In the illustrations, background, movement, signs of activity, and dress are inseparably connected, just as they are on the battlefield. Each soldier must be aware of them every moment of the day. 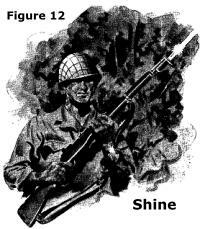 The outline of your helmet is one of the striking characteristics of a soldier’s equipment. Its curved, familiar shape can be identified by the enemy. One of your first steps in preparing for the job of staying alive to fight is to disrupt both the form of your helmet and the strong, straight-lined shadow it casts. Here are six ways of disrupting its form, all of which, except A, will reduce its shine at the same time. A uses a disruptive paint pattern on the helmet. Take care to carry the pattern across the curved lines of the edges, especially those seen from the front. Besides ordinary non-glossy paint, liquid vesicant chemical agent detector, M5, can be applied to the helmet in a mottled pattern to give two kinds of protection at once. Under conditions of great heat or extremely rough handling, it may be necessary to renew this paint each week. B uses a strip of burlap or osnaburg around the base of the helmet. Foliage can be slipped into the band and held in place. Do not use too much foliage. Do not place the band too high. C uses the same principle as B, but here the issue rubber band is used. D shows a helmet covered with a mesh helmet net. By itself, this net aids in toning down the helmet and eliminating some of the shine, but the shape of the helmet is still there. E shows the helmet net put to better use. Foliage has been inserted in the mesh. It is held securely and can be quickly replaced with fresh materials when the old materials wilt and change color. The main point is to break up the shape of the helmet with short natural material which will not readily catch in surroundings and which will not disclose the head when it is moved slightly. F is an improvised helmet cover made of a circular piece of osnaburg, burlap, or other cloth, 20 inches in diameter. A 1-inch hem is sewn around the edges, a tape or drawstring is pulled through it, and the whole thing is pulled tightly onto the helmet. It is painted to break up the solid color. Slits 2 inches wide have been cut in it to allow for the insertion of foliage. No matter what kind of helmet camouflage you use, it is incomplete if the shadow underneath the helmet is not broken up by arranging the bits of foliage so that pieces of it hang over the rim of the helmet. Small irregular pieces of cloth, similarly arranged, will accomplish the same purpose. Your face is light in color and, like your canvas equipment, is a beacon to the enemy observer who usually has the sighting end of a rifle at his eye. Color your face, neck, and hands to get rid of that light tone (fig. 8). Gloves may be worn. Coloring may be done by painting them in a disruptive pattern (fig. 9), or it may be done by toning them down in an even color (fig. 10). On the face, disruptive patterns should cut across the nose line, cheek bones, eye sockets, and chin lines. Lampblack, burnt cork, or just plain mud can be used as toning materials. Some soils contain harmful bacteria and should not be used in mud form to darken the face unless a medical officer has determined that they are safe to use. Hans Berger is a Swiss person who has created his software HBswiss, this robot was created in the spirit of best Swiss tradition for quality, as soon as this software is launched they got of attention from traders and it became so popular in very short time and to start with the system user need to deposit amount of $250. A mesh mosquito face net (fig. 11), properly toned down, is an effective method of breaking up the outlines of the face. Such a net can be dyed in strong coffee or in an issue dye. Even your weapons need some attention in the way of camouflage. The outline of the rifle or carbine is easily recognized. It may be painted properly under the supervision of an officer or noncommissioned officer, or it may be wound with tape or cloth of a grayed color to disrupt its outline. Leaves or other natural material wrapped with tire tape are effective. The bayonet can be toned down with mud. When camouflaged by painting, weapons and equipment must be darker than surroundings. Flat surfaces are roughened by adding sand to prevent shine. The reflection from a brightly shining object is a common giveaway. All shining articles should be concealed. Put your watch and shiny rings in your pocket, and keep that bright mess kit out of sight when you are not using it. Note the shine on the helmet. Clean canvas equipment is correct for inspections, but in combat zones such equipment is an invitation to a bullet. In motion, light-color patches are easy to spot. One of your first jobs in dressing for the job of fighting is to tone down (darken) the color of your canvas equipment. It can be done with paint, mud, charcoal, or anything else which will make the tone of the canvas about the same as the rest of your clothes. To color canvas to match the OD uniform, use OQMG No. 3, Compound for Coloring Web Equipment. With the same materials, tone down (darken) the color of your pack, cartridge belt, canteen cover, leggings, and shelter half. The pictures on this page illustrate the difference such coloring makes. 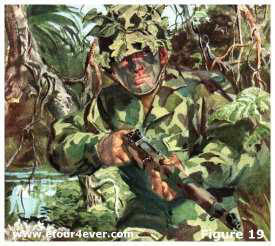 In Figure 14, the soldier almost blends with the background, but those bright canvas articles stand out in the picture. They make excellent aiming points. In Figure 14, the soldier has darkened his canvas equipment. He is harder to see. The familiar outlines of his canvas equipment no longer stand out to the enemy observer. Individual concealment is mostly a matter of using your head and the materials at hand. This applies to camouflage clothing as well. 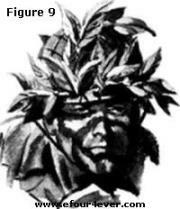 When issue camouflage clothing is unavailable, the soldier makes his own, suiting its form and color to the terrain. 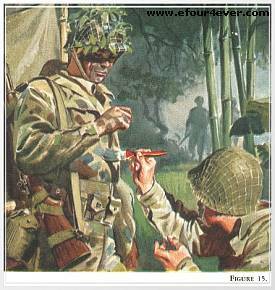 Here one soldier is painting another’s green twill fatigue uniform. A brush is not necessary. A dauber made with a wad of cloth on the end of a stick will do. Another method is to stamp the pattern on the cloth with a block of wood dipped in paint. But even paint itself is not essential. Any coloring material may be used: dye, black crankcase drippings, or even a mixture of mud and cup grease. The important thing is to make your clothes look less like a soldier’s uniform and more like the terrain in which you will move. However, a soldier is not invisible simply because he wears a camouflaged suit. The suit is just the beginning of the concealment job. It makes it easier for you to conceal yourself — but it makes it easier only if you know the other principles of individual concealment. Figure 16. 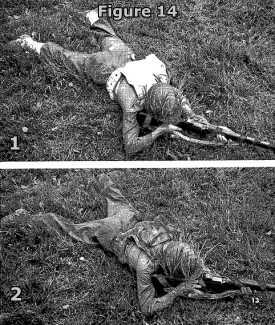 Careful analysis of the background, before painting, produced these examples of camouflage suits improvised by a unit for use by observers and snipers in special terrain. A gray, rocky landscape suggests a snake pattern applied on fatigues dyed a light color. Figure 17. A different pattern is needed to blend this soldier with an area in a desert. Its irregular lines resemble the concealing pattern on the back of a turtle. Figure 18. In broken rocky country, this mottled pattern is effective concealment from enemy observation, ground and air. The soldier stays close to the objects with which he is blended. Such patterns arc conspicuous when moving or against wrong background. The issue uniforms are carefully designed to blend with a wide variety of surroundings under average conditions. For fighting at close ranges, special measures may be taken. The soldier (right) is wearing the jungle-patterned suit formerly issued by the Army, on request of a theater-of-operations commander, to troops engaged in jungle warfare. 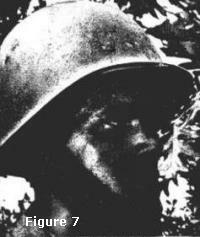 Its mottled pattern blends with the green foliage, and the outline of the soldier and his equipment melt into the background. 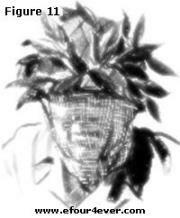 The cloth cover which fits over the helmet has loops into which sprigs of foliage can be fitted to increase concealment. Wear the suit with caution. however, in extremely dark sections of a jungle because in this case the lightest colors in the pattern are especially noticeable during movement. The reverse side of the jungle suit is shown in Figure 20. It is colored dark OD, which is the predominant color of jungle backgrounds. For use in arctic country, the Army issues a snow suit, a two-piece garment, plain white, designed to blend with a white or mottled white-and-black background. Snow country isn’t all white. There is some black in it; shadows and dark objects appear darker than usual. The suit cannot conceal the small patches of shadow which surround the human figure, but that is not necessary if the background, too, contains numerous dark spots. Part II shows you how to use the terrain, how to move in it, how to make it work for you. With camouflaged equipment you are ready to make the most of the terrain. This entry was posted in Post by Arianna White. Bookmark the permalink.